Here are a few current and very recent articles from Fars News that I think are interesting. These and similar articles over the last month or so indicate how seriously Iran is working to surround itself with allies, militarily and economically. Worried about anyone flying over neighboring territories? Iran and Pakistan finalized an agreement to build a gas pipeline which is due to take Iran’s rich gas reserves to his energy hungry nation, a Pakistani official announced. Iran is forced to import gas for its northern territories because the country’s terrain obstructs supply routes from the energy-rich south.Azerbaijan and Iran are linked currently via the 1474.5 kilometer Kazi-Magomed-Astara gas pipeline. 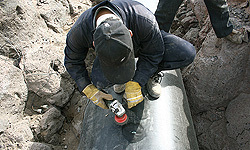 In December, 2009 the Iranian Ambassador to Azerbaijan, Mohammad Baqer Bahrami, said that a new pipeline is needed to supply Iran with the 5 billion cubic meters of gas that it would like to import from Azerbaijan every year. 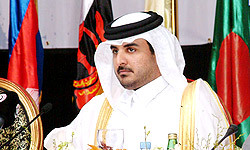 TEHRAN (FNA)- Qatari Crown Prince Sheikh Tamim Bin Hamad Al Thani underlined his country’s resolve to strengthen relations with Iran. Also in a meeting with Qatari Chief of Staff of Armed Forces Major General Hamad bin Ali Al Attiyah, the two sides discussed ways for fostering bilateral cooperation. “Iran’s policy seeks help to peace and security in the world and strategic Persian Gulf region,” Sohrabi said. Qatar’s Chief of Staff of Armed Forces on his part expressed the hope that bilateral relations could be expanded further. “Security and stability in the Caucuses region should be strengthened through a regional approach,” Mottaki said in a meeting with Armenia’s ex-president Robert Kocharian here in Tehran today. TEHRAN (FNA)- Iranian Parliament Speaker Ali Larijani is scheduled to pay visits to Kuwait, Kenya and Uganda next week, an advisor to Larijani announced on Wednesday. TEHRAN (FNA)- Secretary of Iran’s Expediency Council Mohsen Rezaei on Tuesday said that Iran and Turkey play significant roles in regional developments. TEHRAN (FNA)- Tajikistan’s Foreign Minister Hamrohkhon Zarifi said that the visit by Iranian President Mahmoud Ahmadinejad to the Central Asian state in early January helped the two countries to identify fresh grounds for mutual cooperation. TEHRAN (FNA)- Iranian Foreign Ministry Spokesman Ramin Mehman-Parast said on Tuesday that Tehran is studying downgrading of its relations with Britain and will take action if it finds it necessary.